While safely bunkered during Black Weekend (used to be Black Friday), giving thanks for what we already have, a quiet moment alone (always a dangerous scenario), had me pondering of things we’re still waiting for as a modern society. I grew up expecting we’d have flying cars by this time, and believed the book “2001 Space Odyssey” to be less fiction, more coming soon, give or take a few years. Hell, we put a guy on the moon in the sixties, a first step to our planetary neighbors. Granted, I was a kid, and never considered serious concepts of economic reality, but really, it’s 2014 already. Why aren’t we throwing Frisbees on Mars? To say I’m a tad disappointed is probably too harsh, but I had such dreams of where we’d be by now. I figured in my retirement years, I’d be able to catch the Pan Am shuttle to the moon for a weekend getaway. The trip would take only a few hours, like going to the opposite coast, because we’d have ion drives. We’re still putting astronauts in an oversized candle and strapping to their asses to a 1,000 metric tons of solid combustibles with nearly a quarter-million lbs. of liquid hydrogen. Coming soon, if you have lots of money, you can ride a mini-version of an inter-continental ballistic missile for a few minutes. I’ll wait for the ion drive, thank you. You’d think we’d at least have an earth-tethered space station where I could catch an express elevator to the platform to do a little star gazing. Guess I’ll have to be thankful for the Hubble satellite and let it go at that. 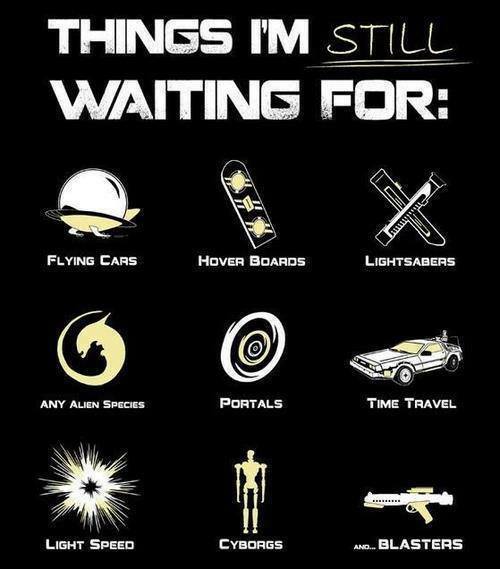 Now that we’ve enhanced our knowledge with reality based physics, I’ll admit a few items on the list might be considered far reaching. We’re still struggling with the theory of light speed, where Einstein got all scientific on us, claiming when we return from an extended vacation among the stars, everyone we know will be long dead. I’m still waiting for someone to declare Albert made it all up, and give us the Enterprise and Captain Kirk. Hover boards? It might work for a comic book character like Silver Surfer, but balance could be an issue for the average Joe, not to mention skyrocketing insurance rates. Portals? Well … it always was more of a “fantasy” thing wizards did. I’m not against wizardry, but it’s hard to scientifically conceptualize magic wands. Surely, by now, I should be tweaking servos on all the body parts that I’ve ruined over the years, and waiting for Amazon to deliver my back-up liver. Why are we still using fossil fuels for transportation and power generation, when we should be tapping some of that 3.9e+26 wattage the sun spits out, free of charge, or have home portable, cold fusion cells with that chicken in every pot? Fired projectiles are so last century. Today’s modern army should be equipped with blasters. Where’s ET? Did he get a wrong number when dialing home? I haven’t given up on time travel. Einstein seems to think time is bendable, which sort of makes up for his dissing light speed. Who am I to argue with one of the greatest geniuses of all time? So if you want to get me anything for Christmas, get me the gift that keeps on ticking. That way, I can fast-forward to a time when we get our act together and make a boy’s dream come true. What do you think we should have by now? Go ahead, dream away.